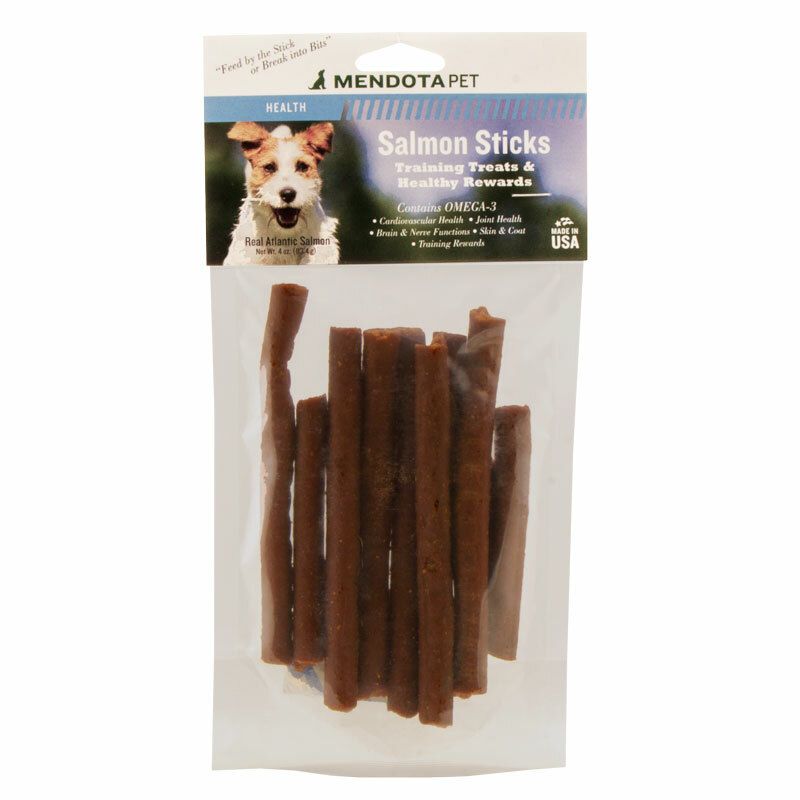 Salmon Sticks Training Treats by Mendota Pet. $6.99. Dog loves them. Breaks in smaller chunks, and doesn't stink up your hands. These treats should be good for our puppy GSP training sessions. I bought these with confidence from Gun Dog Supply, a company you can surely trust!!! Retrieve Health SALMON STICKS are made from real Atlantic Salmon. These delicious sticks are a tasty treat your dog will truly enjoy! Rich in Omega-3 oils, salmon is beneficial for your dog's health. High in natural protein, these heart healthy training treats are excellent for rewarding man's best friend. Preservatives -- potassium sorbate, natural tocopherols, and rosemary extract. It's the time of year for new puppy spring training for a lot of people. When it comes to training puppies, I know none better than Tom Dokken, owner of Oak Ridge Kennels and inventor of the Dead Fowl Trainer. I asked Tom to give us a few tips that will help train that eager-to-learn pup. We have all seen the bumper stickers "Will hunt for food" or "Will work for food." When I think of starting to train a puppy, the second slogan-- "Will work for food" -- is the one by which I live. First, only start training with treats before your puppy's normal feeding time. This ensures your puppy will be hungry and receptive to the treats. The key to treat training is finding a treat that your puppy can't live without. For some, it will be a small kibble of the food that they normally get, but I prefer Salmon Sticks from Retrieve Health -- something about them drives my puppies crazy and makes them more responsive! Start by getting your puppy to take the treat out of your hand. Make sure to get on your knees and call your puppy's name while holding out the treat. It won't take long for your puppy to realize that your hand is the reward source, and you have now started a voice command and a visual hand stimulus. Training is best done without a lot of distractions as there are some things you just can't compete against. Now that your puppy is responding to its name and running to you for a reward, you can start to use the word "come" or "here" followed by the giving of the treat. After a few days of this drill you are ready for the "sit" command. Start the "sit" drill out with the "come" command. When your puppy gets to you, keep the treat in your fingers and raise it up so your puppy has to raise its neck up to get the treat. As you raise the treat up, slowly push your puppy's rear end to the ground with your free hand. When your puppy's rear is on the ground, give the treat. From here on out, every time you call your puppy you will only give the treat when the "sit" command is completed. If you have to continually push your puppy's rear end down before the treat, keeping doing so -- the process will go smoother with repetition. The last command will be the "down" command, which I prefer to start only after the puppy has mastered "come" and "sit." 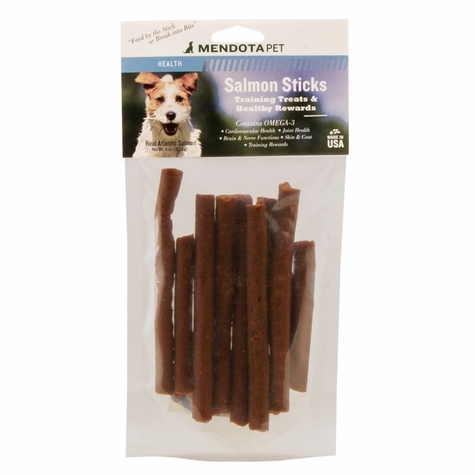 Using the Salmon Stick treats, call your puppy to you. Your puppy should come running to you and sit, expecting the treat. Take the treat and hold it on the ground between your forefinger and thumb. Your puppy will follow your hand down but don't let your puppy grab the treat, keep it held between your fingers. As your puppy is trying to get the treat, push down on your puppy's shoulders until your puppy is in a down position. The key is to release the treat only when your puppy's belly touches the ground. In little time, with proper timing and repetition, your puppy will start to follow your hand to the ground and go into the "down" position on its own.